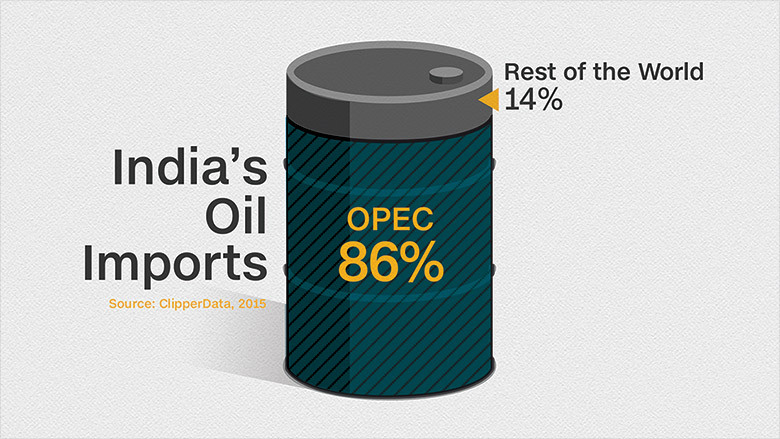 India's got an oil problem. India also lacks a strategic petroleum reserve, or emergency stockpile, that would protect against supply disruptions. Now India is trying to build a buffer. The country's new budget allows foreign oil companies to avoid taxes on crude that is stored in the country. At the same time, India is working to build vast underground caverns that can be used to store petroleum. It's a shrewd strategy given the crash in crude prices and excess supply being pumped by OPEC nations like Saudi Arabia and Iraq. "Entering into relationships with oil producers in the Middle East makes a great deal of sense considering India's consumption is continuing to grow and they don't have the oil themselves to meet that demand," said Matthew Smith, director of commodity research at ClipperData, which tracks global movements of crude oil cargo on sea. India's rapid growth has made it the world's No. 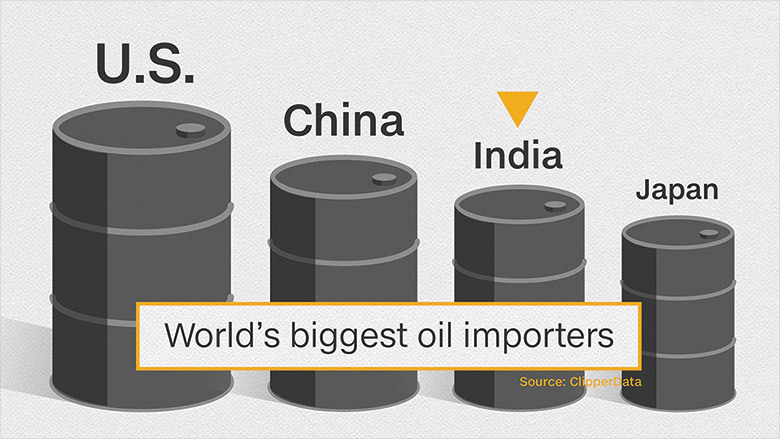 3 oil importer, behind only the U.S. and China, ClipperData research shows. By 2035, the country will need to import 92% of its oil, up from 73% in 2010, according to the International Energy Agency. That makes energy security a major issue. If crude supply was restricted, the nation's fleet of commercial trucks would be sidelined, and its vast railway network taken out of commission. The economic consequences would be profound. A strategic petroleum reserve similar to those of the United States and China would help protect India from such an event. Already, a state-owned Indian company is working to build three caverns with 5.3 million metric tons of capacity, or about 12 days worth of supply. The first cavern, in Visakhapatnam, has been completed and filled with oil. Two other caverns, located in Mangalore and Padur, are scheduled to come online this spring. Plans call for another 12.5 million metric tons of storage capacity in a second round of expansion. That will add an extra 28 days of supply to national reserves, the government says. It's likely that these caverns will be filled with OPEC oil. The cartel already supplies 86% of India's imports, led by Saudi Arabia, Iraq, Venezuela and the United Arab Emirates (UAE). India is working with the UAE on the Mangalore project. India's oil minister Dharmendra Pradhan recently said the country is seeking "favorable terms" for Indian oil companies to import crude oil from the UAE. "The UAE is a great example of an oil producing country that can't find a home for its oil and is running out of space to put it," said Smith. Last month the Crown Prince of Abu Dhabi, the capital of the UAE, led a business delegation to India aimed at boosting bilateral trade between the two countries by 60% within a decade. Anwar Mohammed Gargash, the UAE's minister of state for foreign affairs, said the country wants to explore more oil sales to India, especially for strategic reserves. "We have great faith in India's economy," Gargash told CNNMoney. --CNNMoney's John Defterios contributed to this report.